Annie’s Paramount Steakhouse (1609 17th St., N.W), a Dupont restaurant that has warmly opened its doors to the LGBT community for decades, is now an American classic. 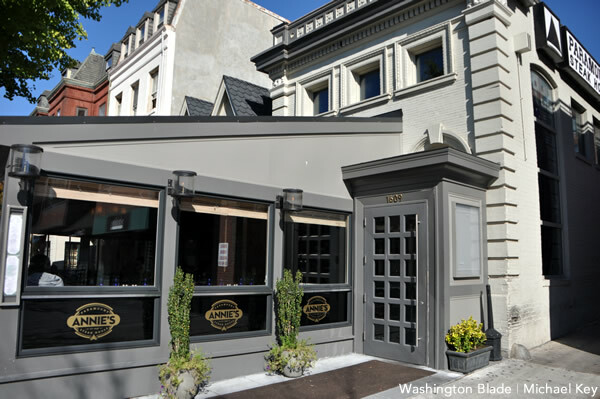 Annie’s Paramount Steakhouse, which celebrated is 70th anniversary in December, is now one of only two D.C. restaurants to receive the James Beard Award. Ben’s Chili Bowl and the now-shuttered CF Folks lunch counter were also given the honor. “Through the years, Annie’s has remained a stalwart supporter of LGBTQ causes, among them the Gay Men’s Chorus, Whitman Walker Clinic, Food and Friends and the Pride parade. At Annie’s, the steaks are hefty, the burgers juicy and the cocktails strong, but what really keeps people coming back is the restaurant’s legacy of inclusiveness and respect,” the James Beard Foundation praised the restaurant in an Instagram post. George Katinas and his family opened Paramount Steakhouse in 1948. Katinas hired his sister Anne “Annie” Katinas Kaylor, to work behind the bar. Her popularity led to the restaurant changing its name to Annie’s Paramount Steakhouse. She was a hit with the largely LGBT customer-base and in the ’60s the restaurant became known as a safe haven for the LGBT community. D.C.-area food critic David Hagedorn penned a post for the James Beard Foundation’s website on his first experience at Annie’s as a college freshmen in the 1970s. “One evening, we made the trek to Annie’s. It was a long, narrow space with low lighting. Most of the clientele were men, laughing, drinking, flirting; all of the staff were women. I felt like I had arrived in a place that was all mine, where the air was fresh and clear, even through a cumulus of cigarette smoke. It was freedom, the same feeling I would later experience when I stepped off the plane in Provincetown or the ferry in Fire Island for the first time. More than freedom, it was community … Soon after Paramount opened, it gained a reputation as a safe place for gay men, many of whom worked for the government and risked losing their jobs and going to jail if their sexuality were discovered. In an oft-recounted story from the restaurant’s early days, Annie went up to two men holding hands under the table and told them they were welcome to hold hands above it,” Hagedorn wrote.